Many of us dealt with “that kid.” That kid who made fun of the way we talked, our clothes or where we were from, leaving us in tears or scared to go to school. The playground bully haunts every school with his/her mean comments and bad behavior, and we all thought that once we left school, we would leave behind the bullies. However, many of us have or will learn quickly that bullying is not just a kid thing. The Workplace Bullying Institute (WBI) defines workplace bullying as, “repeated, health-harming mistreatment of one or more persons (the targets) by one or more perpetrators. It is abusive conduct that is threatening, humiliating or intimidating, work interfering (sabotage) or verbal abuse.” ** But what does this mean exactly? Although it’s not typically physical, bullying is a form of violence that causes emotional and mental harm, and because of that, it’s actually tough to identify if you or someone you know is being bullied. WBI wrote out a list of signs to help you determine if you or your friend is a victim of workplace bullying. Document incidents: As most matters at work, a paper trail can be your best friend. Keep a log of your interactions with your bully, so it’s easier for you to talk about specific instances and how you dealt with them. Stay professional: Bullies try to push your emotional buttons, but do your best to protect your professionalism. This is also easier said than done, but respond to the bullying in a way you’re proud of. Talk to HR: Talk to somebody you trust who will take action, like HR. Although you may have a good relationship with your boss, he/she might not want or be able to get involved. 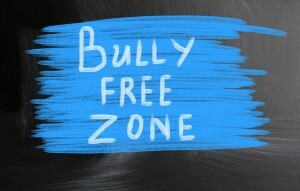 Your company’s HR team has been trained in how to handle bullying, so they will be your best bet. Change jobs: Finding a new job is not letting your bully win; it’s taking a stand and advocating for your emotional health. You deserve a safe work environment, and if your company cannot provide it to you, find a company that will. If you have witnessed any bullying behavior, remember the golden policy – if you see something, say something. Either stand up for the person being bullied or bring the incident to HR or a leader you trust. Again, bullies thrive in environments that lack action. Action doesn’t always need to come from the top down – you can make the difference from where ever you sit – remember that. Again, bullying is not just a kid thing, and although there are not laws to protect everyone outside of the schoolyard, that does not mean we have to tolerate the behavior. Take a stand for yourself and your teammates, and help us get rid of bullying in the workplace! This entry was posted in Clients, Currently Employed and tagged being bullied at work, bullying, Unity Day, workplace bullies, workplace bullying. Bookmark the permalink.